"I grew gourds in my garden and tried to dry them but they started to mold so I threw them away." Oh, those are painful words to hear. Gourds are supposed to mold. Mold is part of the natural drying process. Mold is also what creates the beautiful markings and patterns on the gourd's skin. 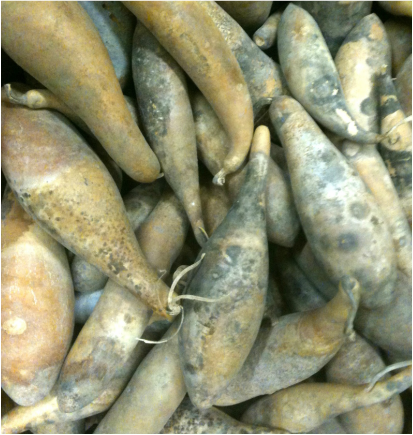 As a gourd dries a white, gray and/or black mold will appear and eventually cover most of the gourd. The mold will become dry and flaky and may begin falling off in small pieces or large chunks. As long as the gourd isn't mushy and/or seeping liquids like an old Jack O' Lantern you are still in good shape. There are many varying opinions when it comes to drying gourds. 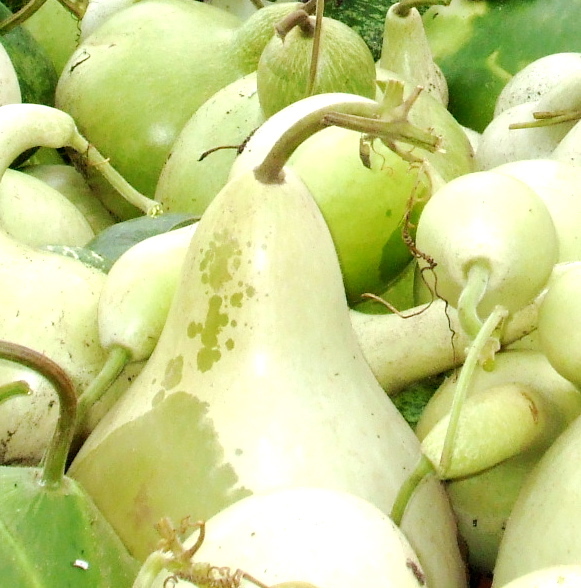 Some suggest washing gourds with a weak mixture of bleach and water right after picking. Others recommend hanging gourds by their stem to dry. We don't do either. We wipe off any large dirt clods then set our gourds on pallets in an unheated barn to dry. That's where they stay (usually unchecked) until spring. It seems to work just fine. Drying time will depend on a number of factors from the size of your gourd to the drying location selected. The best locations provide good ventilation and airflow. Most gourds will take several months to dry. Large gourds may take up to a year to dry. NEVER dry gourds inside of your home. Contact with mold is extremely hazardous and may cause serious health problems. Always wear a mask when handling gourds and work outside. So, how can you tell if a gourd is dry? Pick it up. Dried gourds are very hard and extremely light-weight. To determine if your gourd is suitable for crafting give it a good all-over squeeze to check for any weak spots. Try to determine the thickness of the gourd shell. Thin shelled gourds work well for painting but you will need a thick shell if you want to burn, cut or carve your gourd. Finally, give the gourd a good shake. Sometimes you can hear the seeds rattling around inside. Yes, you can plant those seeds so be sure to save them!